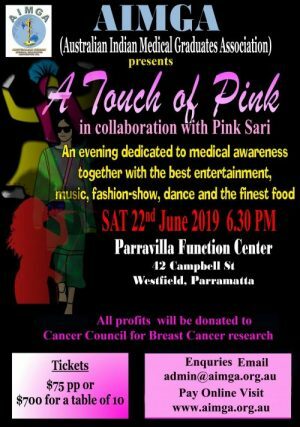 Please join us at Parra Villa Function Center on Saturday 22nd of June 2019 for a night of great food and entertainment. Tickets Adult $75,Table of 10 $700, includes a three course meal, alcoholic/non alcoholic beverages, entertainment. All profits will be donated to Cure Cancer Australia Foundation for breast cancer research. AIMGA has raised a substantial amount of money for local and international charities thanks to the thoughtful contributions and participation of its members. Please join us for our fun filled event for 22nd June 2019. A ticket includes a three course dinner and alcoholic/non-alcoholic beverages as well as a variety of entertainment. Australian Indian Medical Graduates Association Inc.